Lock in a great price for Villa Rossa – rated 9.2 by recent guests! It is a beautiful hotel, very centrally located. The breakfast served is very good. Ronald, the owner, is super friendly and helpful with anything that comes to anyone’s mind. Words are not enough to describe his hospitality. It felt like we were there visiting a family member. Thank you for everything, we will definitely come back! We really loved the building itself which is a a characteristic building. The hotel has 16 rooms in 2 floors. Well located next to the airport, 2 supermarkets and easy drive to beach and Chios center. The open buffet breakfast was quite fresh and good enough. Free parking. Rooms are clean and big enough. What we most liked was the attention and hospitality of the owner family : Ronald and his daughter Elizabeth. Special thanks to Elizabeth who has given us great recommendations on the restaurants, beaches and sightseeing. Being able to speak in Turkish and English if you wish... I definetely recommend for your short visits. The general ambience and style of the whole property was totally different from places stayed at previous locations,very much in a grand style that reflected the character of the historical importance of the building. Would definitely stay again. To start with, the hotel itself is amazing! It is an old renovated mansion, built in 1905 and that makes the place unique! The owner welcomed us with refreshments and was friendly and hospitable all the way! He gave us useful and valuable information as far as the sightseeing (maps, roads, restaurants to eat to) and our breakfast in the dinning room was more than satisfactory! Our room was very pleasant, clean and quiet with all the amenities we needed! We have left with the best of the impressions and we would like to thank once more the owner who made us feel at home with his kindness ,warmth and hospitality! Great hotel with new owner and staff. Second home now. Sehr schönes ruhiges Hotel. Robert war sehr aufmerksam und freundlich! Jeden Tag werden die Handtücher gewechselt und gereinigt! Villa Ross ist auf jeden Fall zu empfehlen.🇬🇷👌🏻👍🏻 Очень хороший тихий отель. Роберт был очень внимательным и дружелюбным! Каждый день полотенца меняются и убираются! Вилла Росс определенно рекомендуется. سلام به تمام دوستان . واقعان که‌ یک هوتل بسیار خوب و در یک جایی بسیار خوب . Otelin konumu, otel sahibinin ve personalin ilgisi, binanın ve yemek salonunun dekorasyonu, odaların yüksek tavanlı olmasını. 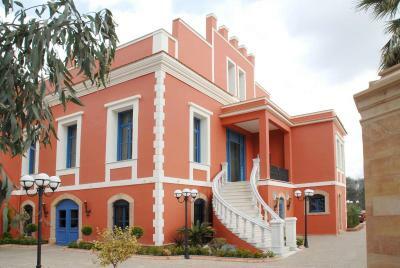 Villa Rossa Chios is a turn-of-the-century neoclassical mansion located in the area of Kampos. It offers tasteful rooms with free WiFi and plasma TV. The nearest beach is 0.9 mi away. The air-conditioned rooms at Villa Rossa Chios are decorated in soft natural tones and have iron beds. They come with a mini fridge, hairdryer and a private bathroom with toiletries. Guests can taste local dishes at the indoor dining area with its stone walls or at the spacious courtyard by the fountain. Guests are offered Turkish breakfast and taditional Turkish tea. Chios Airport is just a 5-minute drive away, while Chios main town and port is at 2.5 mi. Free on-site parking is provided and the property can arrange a car rental. This property is also rated for the best value in Kambos! Guests are getting more for their money when compared to other properties in this city. When would you like to stay at Villa Rossa? Air-conditioned room with a plasma TV, mini fridge and hairdryer. House Rules Villa Rossa takes special requests – add in the next step! Villa Rossa accepts these cards and reserves the right to temporarily hold an amount prior to arrival. It has a very nice garden, i wish the breakfast was served in the garden. Our staying was wonderful , so there are no any negative comments from our side!